The projection of up to 24 aircraft for specified operations anywhere in the world. The Air Group could be tailored, depending on the political requirement, and could include Sea Harriers (FA2), RAF Harriers (GR7), Merlin (Anti-Submarine), Sea King (Airborne Early Warning), Chinook and all other military helicopters. 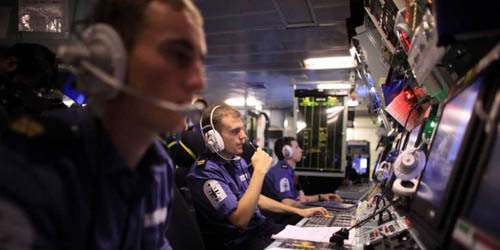 The provision of command, control, communications, computer, intelligence and information facilities for maritime, joint and combined operations. The support of joint, combined and amphibious operations through the deployment of support helicopters, troops and equipment in the Landing Platform (Helicopter) (LPH)/Fast Dash Role. The projection of non-operational aspects of British foreign policy objectives including trading interests. Peace support operations and aid to civil power including disaster relief. For its role as a Command and Control ship, HMS Ark Royal carried the most advanced and sophisticated facilities afloat in the Royal Navy. The Operations Room was the nerve centre. All the information required to conduct operations was displayed on a maze of radar screens and visual display units. Manning these displays were the various specialists of the Warfare Department. Aircraft controllers directed the ships Harriers, Merlins, Sea Kings and any other aircraft in the ship’s vicinity. Radar operators compiled the picture from the information received from external sources as well as the ship’s radars. Electronic warfare specialists provided early warning of attack. 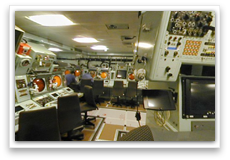 Weapons specialists operated the weapon systems and sonar specialists manned the sonar displays hunting submarines. All of the specialists were co-ordinated by the Warfare Officers who effecitively fought the ship under the direction of the Commanding Officer. The presentation of the enormous amount of information required for these activities was an extremely complex process requiring speed and accuracy that could only be provided by computers. At the heart of the ship’s Action Data and Weapon System were large computers which gathered, collated and displayed all the data required by the operators for decision making. Once decisions were made, the same system was then used to control the various weapon systems. Clear, reliable communications are vital to a warship. 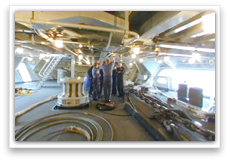 The facilities available in Ark Royal were the most comprehensive afloat in the Royal Navy. 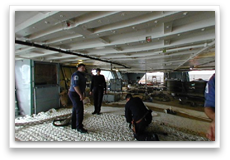 Extensive use was made of satellite communications as well as the more conventional long range HF and medium range UHF systems to maintain contact with shore headquarters, ships, aircraft and submarines.